This Friday, September 8, the Miriam and Ira D. Wallach Art Gallery at Columbia University’s Manhattanville campus will open a new exhibition, Living in America: Frank Lloyd Wright, Harlem, & Modern Housing. Developed by Columbia GSAPP’s Temple Hoyne Buell Center, the Wallach Art Gallery, and the Avery Architectural and Fine Arts Library, the exhibition is presented in tandem with MoMA’s current show Frank Lloyd Wright at 150: Unpacking the Archive. This exhibit, however, will center two parallel narratives: Wright’s vision for Broadacre City, an exurban solution to questions around housing as an alternative to dense urban environments, and the simultaneous development of Harlem’s first public housing for working-class African Americans. Presenting a range of drawings, archival photographs and other paraphernalia from the late 1920s to the late 1950s, the show aims to present conflicts around what inclusive housing can and should look like, and the particular problems this question posed in an era of trenchant segregation and economic inequality. 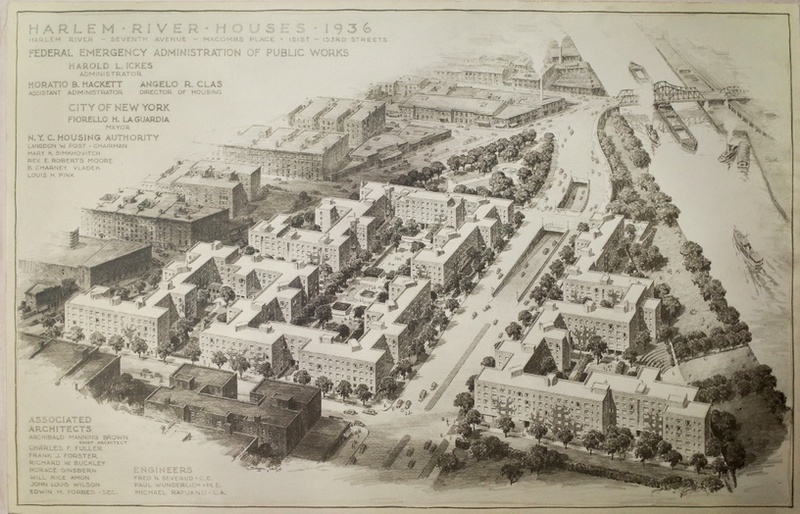 Tracing Broadacre’s inception in 1935 and its afterlife in much of Wright’s later work alongside the 1936 groundbreaking of the Harlem River Houses under Roosevelt’s New Deal, Living in America abuts not just questions about housing but its social consequences, from the structure of the nuclear family to debates about the privatization of public space. The show’s title is drawn from an inscription on panels accompanying the physical Broadacre City model – now iconic and highly disputed among planners, architects and landscape architects alike. In addition to the exhibit, The Buell Center will host a symposium on September 28 and 29 as part of its longer-term research project, Power: Infrastructure in America, which has previously presented programs with the likes of Forensic Architecture’s Eyal Weizman and author Kim Stanley Robinson. September 8 from 6 – 8 p.m.